"Farm, Inc." is a multi-part series exploring the hurdles and joys of trying to be a full-time farmer in and around Lawrence [Kansas]. 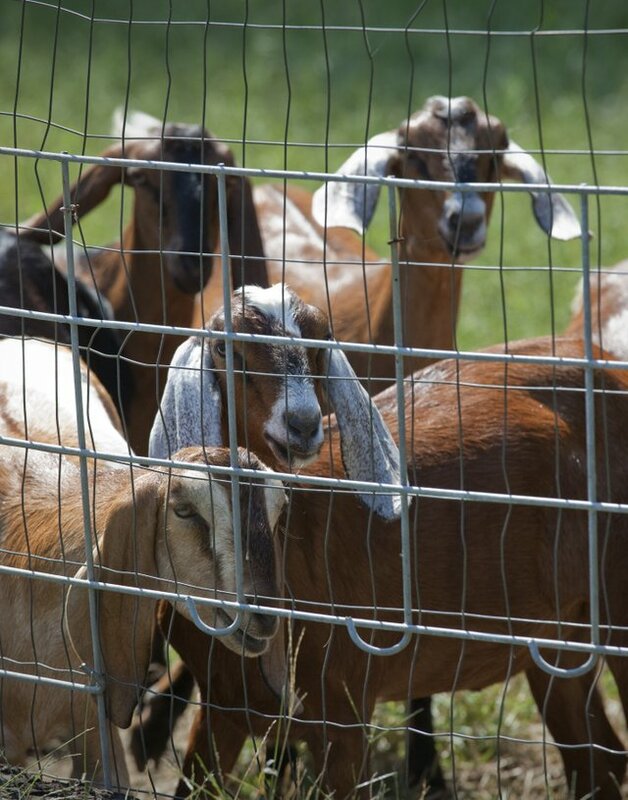 Business has been booming for Goddard Farm since it received a Grade A dairy license in May, but in some circles raw goat milk is still in demand. Nubian kids head up to the fence for a head scratch at Goddard Farm in Lecompton. Full-grown nubians can produce a gallon of milk per day. 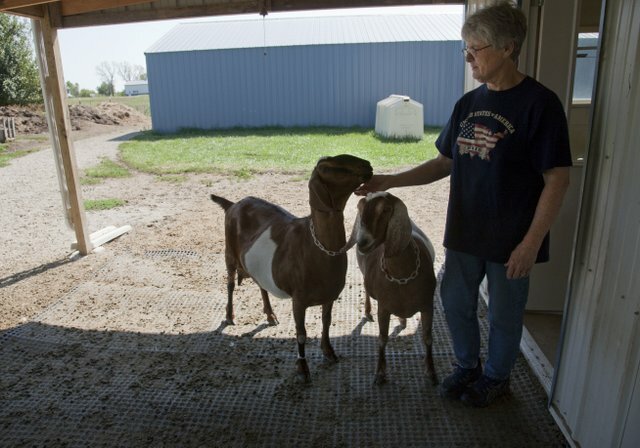 Sue Goddard greets two nubian goats in the back of the dairy barn at her farm in Lecompton. 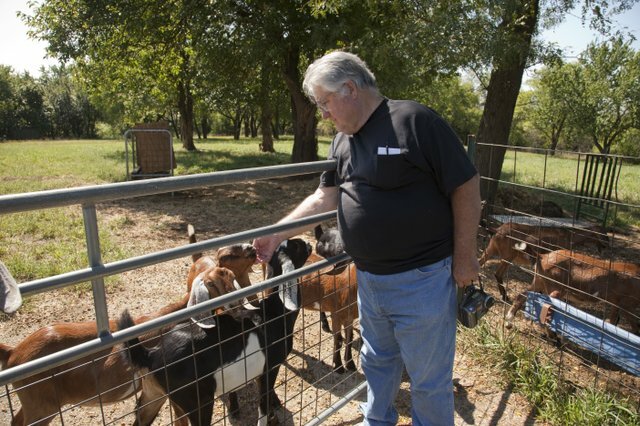 Goddard milks the goats twice a day, usually around 8 a.m. and 8 p.m.
Noah Goddard and his wife, Sue, have raised nubian goats at their farm for over 21 years just west of Lawrence. After 25 years of selling raw milk, the Goddards moved into pasteurized products in May and have doubled their business. Lined up along the fence, the kids clamor around for attention. Noah Goddard leans over, his body braced against the chain-link as he tries to pat each head bobbing his way. The scene is a mashup of a dad visiting school during recess and a petting zoo. These kids happen to be kids, as in young goats. Nubian goats, to be exact, standing on their feeding troughs, their long, floppy ears swinging wildly as they try to nudge each other out of the way, each hoping for a head scratch. There’s Raspberry, Misty, Cantaloupe, Penny and Katiwhompus and three dozen other kids, does and sires contained in various pastures on Goddard Farm, run by Noah and his wife, Sue. The Goddards have been raising hormone-free goats for 30 years and selling goat milk for 25, turning it into their full-time income in what has become a very busy retirement. In May, the Lecompton farmers earned their Grade-A dairy and manufacturing license from the state. That means that the raw milk producers have branched out into pasteurized production, allowing them to sell their milk, yogurt and cheese to groceries and restaurants, and effectively doubling their sales. Now, the farm’s products are positioned in The Community Mercantile, and Hy-Vee and restaurants, such as Pachamama’s, where head chef and owner Ken Baker loves the stuff as much for its quality as its local origins and hormone-free promise. The Goddards got into goat milking in 1979 after learning that dairy producers were dabbling with bovine growth hormone. The Food and Drug Administration didn’t approve the use of recombinant bovine growth hormone (rbGH) for use in dairy cattle until 1993, but scientists had been injecting cows with material from bovine pituitary glands since the 1930s because it seemed to increase milk production. Later, according to Cornell University, it was found that bovine growth hormone was the key substance that made the “more milk” equation work. And, by the 1980s, scientists were able to produce enough of the substance that it was possible to use it in large dairy operations. After a few years of enjoying the milk themselves and giving leftover milk to friends, the Goddards began acquiring more goats and selling the milk raw on the farm, which is legal in Kansas, but comes with at least two major disadvantages to the business owner. One, the milk must be purchased at the farm in person and two, a raw milk seller cannot advertise its product save for a single sign on the farm’s property. Which, as one can imagine, can make selling the farm’s extra milk quite the task. What they do, it turns out, is dump the leftover on the compost pile, meaning they were quite literally throwing money away. Add to the equation feed and upkeep, and the numbers just weren’t adding up as long as they stayed within the raw milk restrictions. But now, five months after receiving their Grade-A license, the full-time farmers are close to closing a deal with Whole Foods to sell their goods in Kansas City and are hoping to make a dent in the local goat cheese market, which is normally dominated by French brands. Baker thinks that they’ll have no problem if they keep it up.